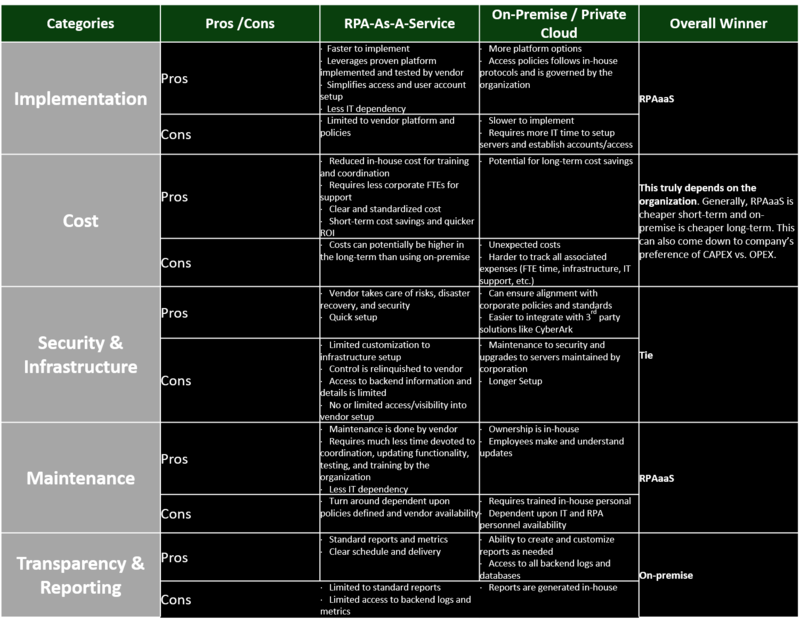 Above, we outlined the 2 extreme ends of the deployment model spectrum for RPA. An additional middle-ground option that has grown in popularity is RPA Managed Services. In this case, the process solution is located on-premise or on an organization’s private cloud. Processes will change, applications receive updates, and enhancements will be needed. In each of these instances, a resource with the skills to implement and test these modifications is needed. RPA Managed Services enables organizations to leverage a skilled RPA Services provider, such as Ashling Partners, to manage the processes in operation and perform needed maintenance in a more customized manner. This is oftentimes a direction taken to reduce costs, ensure processes in production run properly and monitored 24x7, and changes are made by trained professionals. If you are going on-premise, you may want to consider leveraging RPA Managed Services for your processes to provide an additional level of support. Both RPAaaS and on-premise have their pros and cons. RPAaaS is the better option for those organizations seeking to get up and running, prove RPA as a concept, scale quickly, or achieve quick ROI. RPAaaS holds the vendor accountable for maintaining the bots, supporting the infrastructure and environments, and providing standard and timely reports. On-premise may be a better option for organizations seeking to save costs by having a large volume of processes automated through RPA, are investing in FTEs with the knowledge to maintain and support the solution, and have sufficient IT support to maintain the infrastructure. If an organization decides to go on-premise or through a private cloud, RPA Managed Services may potentially be a great option for monitoring processes in production and performing needed maintenance.